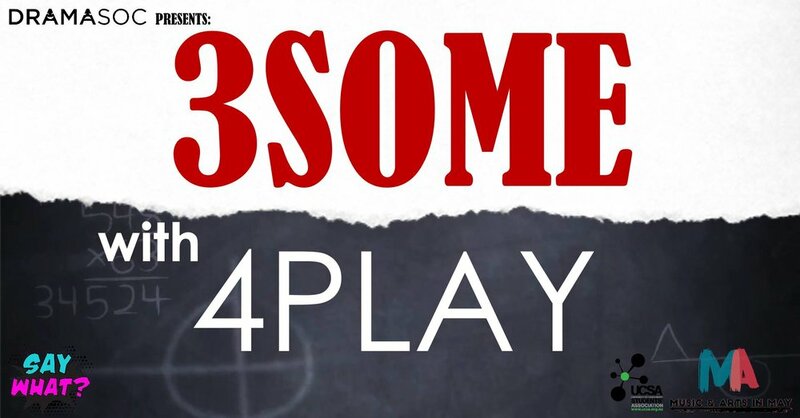 3SOME is a classic DramaSoc event in which we take 3 original scripts, 3 directors, 3 casts, 3 weeks, 3 lots of $33 and then put on 3 original one-act plays each night for 3 nights! And the best part is that the tickets are only $3! No need to book your tickets in advance, just come along and check out some awesome plays! Because we are in Bentleys, the event is R18 (unless you're with a legal parent or guardian!). Dougal Frame is directing Cameron Lines' Service, Please!, a script about the struggles of hospitality on a busy day and the journey of one person's trial by fire in the industry. Our second script is Welcome to Heaven by James van Dyk, directed by Pim Van Duin. This piece challenges typical views of the afterlife and its associated deities, and tells the story of one person who finds themselves there. Liam Boardman is our director for the third and final script, Party at Sarah's House, a story by Craig Westenberg in which two men find themselves to be dating the same woman and then try to piece together how that happened.